Washington, D.C.Car Insurance Quotes and Regulations « Car Insurance Calculator – Car Insurance Estimator for You! CarInsuranceCalculator.info's guide to Washinton, D.C.
Washington D.C. also requires you obtain uninsured liability of $25,000 per person, $50,000 per accident and $5,000 for uninsured property damage with a deductable of $200. If you visit another state, or just drive occasionally to Washington D.C: Most auto insurance policies come with a provision that will adjust your coverage from the minimums required in your state to the minimum insurance or proof of financial responsibility in another U.S. state. So you do not need to get a new insurance policy for each state you are driving through. However, if are commuting from one state to another, you probably need to adjust your coverage so you meet all limits of the relevant states. Visiting another state every now and then is typically not considered commuting. Please check details for your case with your insurance agent. Furthermore, if you buy for any reason a policy in a low limits state (like Washington D.C. or Washington) but live in a high limits state (Alaska, Maine and Wisconsin are on the higher end), insurers will only write a policy where your car is principally garaged. So if your home is in Wisconsin, you should buy the minimum limits for Wisconsin. As for all US states, Washington D.C.’s required insurance limits are low, only compared to average cost of repair and damages likely to occur in an accident. If you are in a serious collision and the damages you caused are greater than the coverage limits you purchased, you may be personally liable to pay for those damages that exceed your insurance coverage. For most drivers it will be a quite cheap strategy to buy additional coverage on their policy in order to benefit from significant enhancements of financial protection. 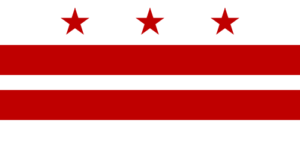 Washington D.C. is a contributory negligence state. A contributory defense based on negligence applies to cases where a plaintiff or claimant “contributed” to his or her own harm through his or her own negligence. If it is found that the claimant was even 1% at fault, the claimant may be denied any compensation. For example, if you are a pedestrian crossing a street outside the crosswalk and a speeding driver hits you, you may be denied any compensation. Washington D.C. is one of the few jurisdictions that follow the contributory negligence standard. In Washington D.C., a first time offense of Driving While Intoxicated (DWI) is treated as a misdemeanor offense. If you are 21 years or older, if you have a Blood Alcohol Content (BAC) level of .08% or higher while driving, Washington D.C. law presumes you are driving while intoxicated. If you are under 21, a lower BAC may apply to you. If convicted, you may be sentenced for up to 90 days in jail, depending on aggravating factors and if your BAC is .20% or greater. A court fine of at least $300 and up to $1000 may be imposed. You will also be responsible for other court fees. Your license will be suspended for up to 6 months. SR-22 or FR-44 forms are required for DWIs in Washington D.C. Read more on these forms here. If convicted, you may be sentenced for up to 1 year in jail. Fines may be imposed of at least $1,000 and up to $5,000. Your license will be suspended for a minimum of 1 year. SR-22 or FR-44 forms are required for DWIs in Washington D.C. Car Insurance in Washington, D.C.
Top Ten Car Insurance Companies in Washington, D.C.